Almost famous…OK, not really, but I am in my first magazine article! Well, OK, I’m included in a picture in a magazine. OK, I’m in a crowd in the upper corner of a photo, but I’m in there! It’s not being in a magazine that makes me smile as much as the type of magazine it is…it’s a running magazine! Who would have thought when I started my gastric sleeve journey that I would ever find myself included in a magazine that was all about running?! This non-athletic over weight woman is now a healthy running woman and she couldn’t be any happier or prouder! Yeah, me! When I post a blog entry like last week’s From Shame to Hope, I always worry about how it will be received. I seem to forget that every time I share a difficult situation I’m having in my weight loss journey, I always feel better afterward. By sharing my experience, I feel a huge sense of relief. Being honest is difficult, but so rewarding. And let’s talk about all the support and encouragement I receive from family and friends. It’s a good reminder that once you share your problems, you are not alone. 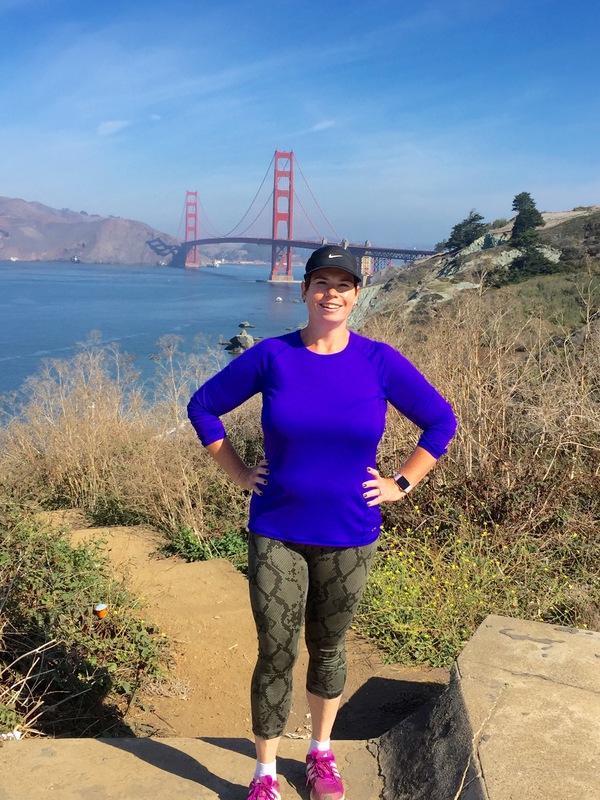 Here I am wearing my new workout clothes while hiking on a different route with a great friend! Changing up my routines is doing wonders for my gastric sleeve journey! *Acupuncture! I thought it was time to approach my health in a different way. I had a short, but pleasant experience at my sister’s wedding last spring. I kept thinking I should try it and one of my biggest supporters, N., has told me for months about her acupuncturist. I finally went to her last week and what a great session! The doctor was informative and calming. No, the needles didn’t bother me at all. The hardest part was relaxing for 25 minutes! I am going back this week. I think coming at my stress and weight gain from a different angle will help me immensely. *New Workout Clothes! Once I committed to running about three years ago, I made sure to buy nice workout clothes. I figured if I wanted to be a runner I should dress the part. Once again my friend, N., helped me this week by taking me to Lululemon for the first time. I’m not sure I would have gone on my own as a store that sells nothing larger than a size 10 still intimidates me. N., my personal fashion consultant found (on sale!) a new pair of running Capri pants and my first running skirt. She assured me that I’m not too old for ruffles on my booty, so I bought the skirt with my Tinker Bell Half Marathon in mind. *Apple Watch! Yes, this was a huge splurge. It’s an early anniversary present from my amazing hubby. Trust me, its way more romantic of a gift than flowers! I ran with a Garmin watch before, but recently started looking into a FitBit as I wanted to track my overall health. Fortunately, I have an extremely tech-savvy husband who did the research for me. He concluded that an Apple Watch was the best investment. Who I am to argue? I love seeing my walking and running stats. I love that it reminds me to stand up and move around every hour. I also like that it connects to MyFitnessPal so I can easily track my exercise along with my food intake. *Food journaling! Yes, I hate it, but it really does help. I’ve decided to track my food on Monday through Thursday to start. If my weight loss continues, I think this will be a less stressful tool. MyFitnessPal does make it easier to track my diet and helps me be aware of my mindless snacking. *Changing up my exercise routine! Each week I make plans to meet up with one or two friends to exercise with. Sometimes it’s running, some times it’s walking. I will learn how to run and talk at the same time! I’m also changing up my program by extending my exercise time, adding stairs, and changing my routes to keep inspired and challenged. *Positive Mindset! This is the most important change I’ve made this week. Some days you just have to scream at yourself (OK, in your head, not aloud) and say “You’ve got it pretty damn good!” To have a loving family, supportive friends, and a healthy body and mind shouldn’t be taken for granted. Sometimes you just need to step back and look at yourself from the outside.